The Malcolm Montage: Sewing Season! Rarely do I get to blog about what I have been doing!! My love of sewing has been rekindled this Spring and I have been driving John crazy with my new introverted hobby. I can always blame him because he bought the sewing machine for me, right?! 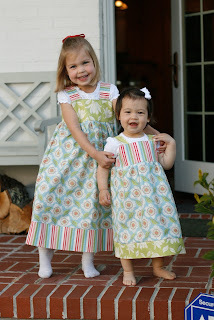 I LOVE having 2 girls to outfit -- one with a will and one who doesn't have one yet. We'll see how long they will let me play matchy-matchy dress up day. Here's a sampling of what my hands have been doing. Thanks Aunt Carrie for the pattern! !